a well balanced wine with with notes of blackcurrant, tea leaves and vanilla spice on the nose. Fresh acidity and a dry finish. 3 to 5 days on skins in open fermenters at 30°C - cap punched manually every 2 hours. 12 - 14 months in 2nd and 3rd fill 225 lit. 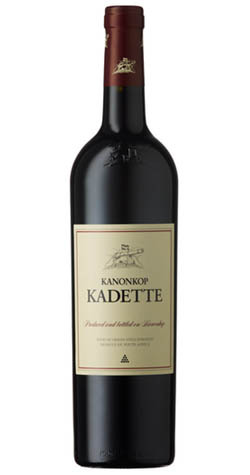 Kanonkop is a fourth generation family estate, which was originally purchased by JW Sauer, a cabinet member in the parliament of the Union of South Africa. Kanonkop Estate is situated on the lower slopes of the Simonsberg Mountain in the Stellenbosch Region of the Cape. It is between Stellenbosch and Paarl on the R44 and falls in a ward called Simonsberg, more commonly known as the “red wine bowl” of South Africa. It has earned a reputation both at home and abroad as an area producing the best wines in the country. Besides the solid foundation on which the estate’s winemaking principles are based, it is also blessed with ideal soils, cool sea breezes and long summer days, creating the perfect climate for growing grapes.